N-EXTRA - Hortiland Holland B.V.
a high dose of microelements. N-EXTRA 30-5-5+TE is especially formulated for foliar application only. N-EXTRA controls any type of chlorosis directly and effectively. N-EXTRA 30-5-5+TE contains a high percentage of micro elements (e.g. fe edta 0,77% plus fe eddhma 0,18%). APPLICATIONS with N-EXTRA 30-5-5+TE will improve the leaf color immediately and at higher doses new vegetative growth is initiated. N-EXTRA is especially effective in plant nurseries at young plants and at plants which have just been transplanted, without causing leaf burn, even at a high dose. 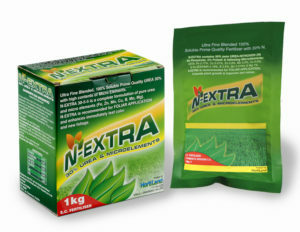 N-EXTRA strongly improves the effectivity of plant protection products, due to their better absorption. Special formula of n-extra for foliar application in olive trees for better fruitsetting and higher yields. Before and after the flowering of the olive trees, there is an increased need for boron. N-extra 25-5-5 + 2%B provides the plant with high quality boron which can easily be absorbed by the foliage of the olive tree.